Monday: barre class. This felt really tough but was great to stretch out my muscles and such. Tuesday: I woke up with a twinge of knee pain. Not enough to see a doc but enough that it was very much present if you know what I mean. It was also a rainy day so I decided to skip speed work in favor of a tempo run – I ran 5 miles at an average pace of 9:52. This was a solid run and I felt good about it. My knee didn’t love it, but again, nothing too awful. Thursday and Friday I rested because I knew I had big miles coming up and my knee still hurt. It’s fair to say that that run was amazing. It was just one of those days where everything was right. I ended it happy. Tired, but happy. Hopefully, race day will go as well as 20 mile day! Oh, and here are the splits: 10:02, 9:50, 10:10, 10:04, 9:48, 9:40, 9:27, 9:46, 9:41, 9:04, 9:41, 9:46, 9:23, 10:09, 10:13, 9:37, 10:22, 10:26, 10:46, 10:45. Obviously tired at the finish, but given the too fast start, not bad! What a week! Hope you all had a great one. Who ran long or raced this past weekend? Yayyy Mar! You are such a great friend! Good seeing you on Friday! it was great to see you as well – sounds like you had an awesome weekend! TRX is harder than it looks huh? Mar @ Mar on the Run recently posted…Week 16: Mission Accomplished! I love TRX and will hopefully be a certified instructor soon. 3 marathons and I still haven’t come close to your pace! You killed it with your 20 miler, congrats!! You are such an inspiration to me. Was your knee feeling okay during that run? Hopefully that won’t be a problem! Janelle @ Run With No Regrets recently posted…Weekly Workout Recap: The Madness is Over! my knee hurt right when i started running (saturday and sunday) but once i settle in, it goes away. i’m going to continue taping and cross training and resting on my rest days! Wow, 20 miles on Saturday followed by more on Sunday! You go girl! thanks! running with friends during MCM was the best because i wouldn’t have run otherwise on sunday and i think my legs feel better today as a result! Wow, great job on your Saturday run! It was a beautiful morning that day. I did my first 13.1 mile run on Saturday and it was a good feeling 🙂 It convinces me I’m ready for Richmond. We went to spectate at MCM too and it’s the first time I’ve gone to just watch a race. It was a great experience! thanks – it was a wonderful day, weather wise! hopefully i’ll see you in richmond — you are definitely richmond ready! Nothing like a run that feels that good. I’ve tried to slow down but sometimes you just gotta do what the body wants. It feels so great at the end. 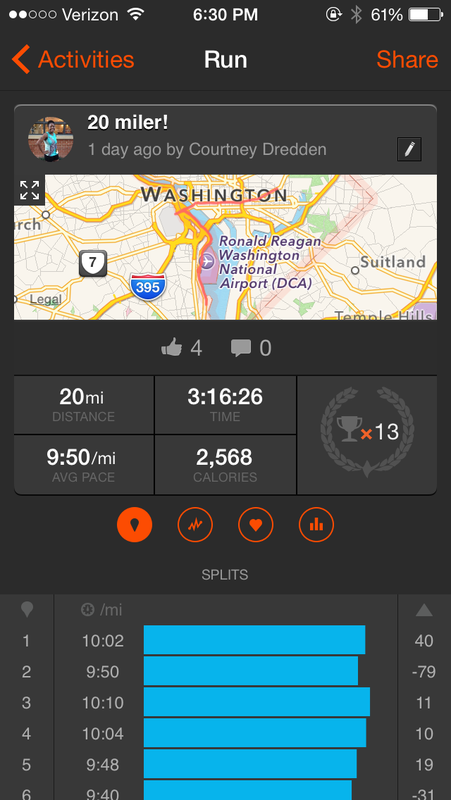 Way to go on the 20 miler – that’s awesome! Yey! So awesome on your 20 mile run, you crushed it. And I”m so happy that you got to see Mar at the finish line!!! So happy for her! thanks sue! i’m bummed i missed you but i hope you feel proud — everyone i’ve talked to had a really tough day in that heat yesterday. you are inspiring! I’m so thrilled that you got to see Mar; that is amazing! I’m so excited for her and congratulations on your 20-miler, Courtney! Woo HOO!! You are so ready for Richmond, girl! You are going to tear it up! Thanks Tara – I’m excited for race day! I have never tried the TRX suspension trainer. It looks like a very challenging workout. 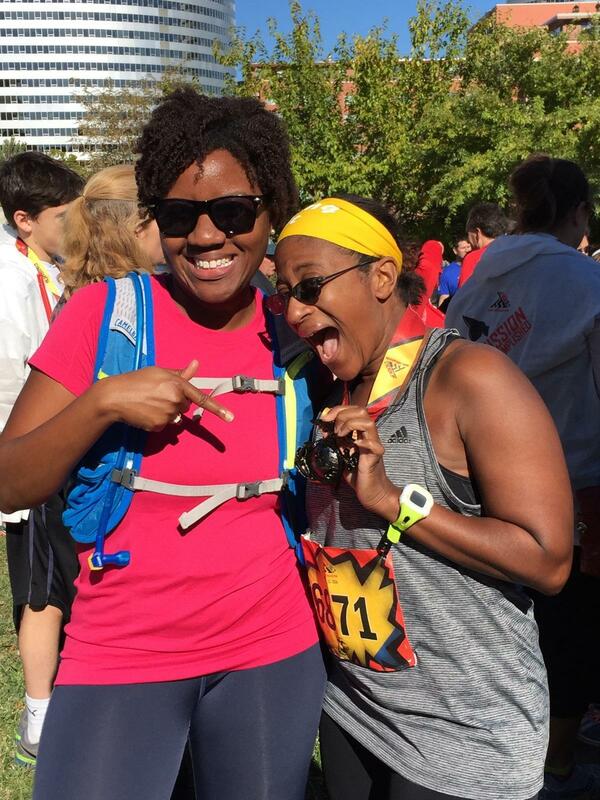 How fun you got to run with your friend during part of the MCM. It really was a great race and beautiful weather. Knee isn’t 100% but not running today is helping 🙂 Thanks for asking! Woohoo! I just started my taper too. So excited to be closing in on race day. They have TRX at my gym. It looks so tough. oooh I am so curious about TRX!